N Scale Model Train or Railroad Channel featuring the trains and railroads of the D&RGW – Iron Horse Route ( Prototype = Denver and Rio Grande Western – Ski Train – Denver to Winter Park, CO. 1950’s ) will be publishing Live Streams where Live Chat can take place as well as how to’s, how NOT TO’s, layout tours, shout outs, product reviews and more. 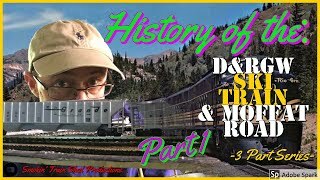 This episode looks in to the history of the D&RGW Ski Train, the prototype for my n scale model railroad. A sequenced look at the origin, construction, financial and other challenges that the developers faced in completing this line. The D&RGW Ski Train line goes from Denver’s, Union Station to Winter Park, CO. The line began transporting skiers as an alternative to personal transportation in 1947. The video was made in the Smokin’ Train Shed on the gulf coast and produced by STS productions in association with the D&RGW – Iron Horse Route – N Scale model train layout. If the above information sounds interesting to you, Click the Subscribe button and the Bell Icon to get alerts and reminders of uploaded videos and Live Streams to come. Also don’t forget to Like this video if you are so inclined. Keep an eye out for the next video in the series “The History and Origin of the Ski Train – Route Part 2”? This will be a video showcasing the trip that the Ski Train takes between Denver and Winter Park, CO.
P. R. Griswold, Before the Moffat Tunnel: Celebrating the Centennial Arrival of the First Train to Tolland, Colorado, June 1904 (Brighton, CO: Sherm Conners Publishing, 2004). P. R. Griswold, David Moffat’s Denver, Northwestern and Pacific: “The Moffat Road” (Denver: Rocky Mountain Railroad Club, 1995). Silvia Pettem, “Rollinsville and Middle Park Wagon Road / Denver, Northwestern & Pacific Railway Hill Route Historic District (Boundary Increase),” National Register of Historic Places Registration Form, ed. S. Doggett (September 29, 1996). Edward T. Bollinger, Rails That Climb: A Narrative History of the Moffat Road, ed. William C. Jones (Golden, CO: Colorado Railroad Museum, 1994). Edward T. Bollinger and Frederick Bauer, The Moffat Road, 2nd ed. (Denver: Sage Books, 1967). P. R. Griswold, The Denver and Salt Lake Railroad, 1913–1926 (Denver: Rocky Mountain Railroad Club, 1996). “Moffat Road/Hill Route,” Endangered Places Archive, Colorado Preservation.